Coastal Sage Scrub (CSS), the dominant native plant community in coastal Southern California, is threatened by conversion of habitat to urbanization. In the remaining protected open space, areas once covered by CSS have converted to grasslands dominated by non-native, invasive species. Frequent fires, drought, and deposition of nitrogen from air pollution have been suggested as possible impacts responsible for this conversion, due to correlative studies. 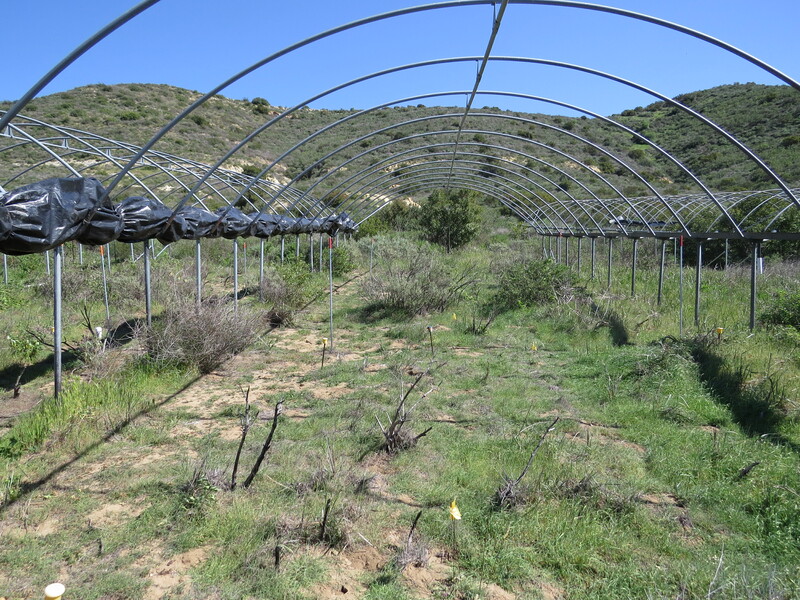 To determine what factors were impacting CSS, a group of researchers at UC Irvine established a large-scale manipulative experiment in the foothills of the Santa Ana Mountains. In 2007, eight large rainfall exclosures were established to simulate drought by intercepting rain falling on study plots below. The structures were closed during large storms, and rainwater was collected in gutters and stored in large tanks. This stored water was pumped onto eight other plots that received more than ambient precipitation, while another eight plots experienced natural rainfall. Each study plot was divided in half lengthwise, and half was treated with extra nitrogen to simulate deposition from atmospheric pollution. The entire area burned in the Santiago wildfire in 2007, and treatments were applied following the fire. Every year, from 2008 to the present, the plant community was sampled in each plot. Investigators studied how CSS recovered following fire in the different treatments. The shrubs recovered quickly following fire in ambient and added water plots, and at a much slower pace in reduced water plots. Shrub cover was higher in the ambient nitrogen plots compared to the added nitrogen plots. Cover of invasive grasses followed the opposite pattern, remaining high in the reduced water plots, but decreasing in the ambient and added water plots. Cover of native wildflowers peaked immediately following the fire and gradually decreased through time in all plots. Fire followed by drought resulted in a community with a high cover of non-native grasses and low cover of native shrubs. Nitrogen addition following fire also increased cover of non-native grasses and decreased cover of natives, but did not, without drought, shift the community to a grassland with less than 50% native shrub cover during the study. Many CSS shrubs survive fire underground and re-sprout following fire. This re-sprouting phase may be an especially vulnerable period, when individuals are more susceptible to water stress. Many CSS species germinate from seed following fire, and seedlings are also vulnerable to drought. For non-native grasses, fire provides an opportunity to colonize open space. The increased cover of non-native grasses in reduced water plots suggests that shrub mortality left more space for the grasses to grow. Nitrogen resulted in increased survivorship and growth of the native shrubs that were able to survive the fire. However, nitrogen also favored growth of non-native grasses. Native shrubs had lower cover in the added nitrogen plots, presumably due to reduced seedling recruitment. The results, recently published online in Ecological Applications, indicate that CSS may be especially vulnerable to invasion by non-native grasses during the early stages of fire recovery. Fire and drought are increasing through time along with nitrogen-deposition, making it likely that more areas currently covered by CSS will convert to non-native grassland. Protection of remaining CSS may require continued removal of non-native grasses, especially following environmental stress such as drought, nitrogen deposition, and fire. Study authors are Sarah Kimball and Mike Goulden with UC Irvine’s Center for Environmental Biology; Katherine Suding with the University of Colorado; and Scot Parker with UC Irvine’s Department of Earth System Science.